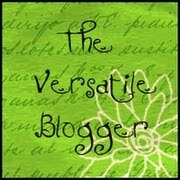 My blog has been honored with a Versatile Blogger Award from Bromography. If you haven’t already been to Bromography, hurry! It’s a great site full of fabulous information. Bromography: Discoveries of New York Foodies has restaurant reviews, recipes, features, event write-ups, and more – mostly about my favorite city and home town, New York! Thank you so much to Elle of Bromography for passing this award along; it’s a real honor. Before becoming a writer I taught middle and high school social studies in Harlem then the South Bronx. I was an American history and South Asian studies double major in college and I studied abroad in India. I am only just learning to love olives. I ate a plain bagel with butter for lunch almost every day of elementary school because I hated the normal sandwiches (I still can’t eat cold cuts unless we’re talking prosciutto). Yes, I was quite the picky eater as a child. Thailand and Morocco are on the top of my “go” list, followed by Egypt and Turkey. And Greece. And Everywhere! Cooking is often the highlight of my day. Nothing makes me happier than making those I love happy with my food. I will pass this award on to the following bloggers. Please take a minute to visit these great sites. They are all a daily source of inspiration for me with beautiful food photography and awesome recipes. Morocco was one of my favorite trips. I hope you make it there someday! And thanks for the link to Bromography. We’re going to New York next month, so I’ll be sure to check it out! Oh Manu! You so deserve it. Love your blog. Haha, funny about the sandwiches! Love it. This award is well deserved! Your posts are always interesting and your photography is beautiful. It is nice getting to know you a little better. (Morocco and Thailand are on my “list” as well.) I cannot wait to get to know the bloggers that you have awarded. If you ever go to Thailand let me know, i will give you some good suggestions. . .it’s my favorite place to travel and if i could i would live there. I do not live olives either. 🙂 It’s one of the few things i do not eat. Aw thanks! You know how I feel about your blog 🙂 Yes yes yes! I’ve looked into tickets so many times and it’s always outrageously expensive, even from Spain or Egypt! But we’ll keep looking! Katherine, we flew to Morocco from Spain, it cost about 100 euros round trip! So cheap that you can’t NOT go. That is amazing. I will need to pump you for info next time we hang out. Thanks so much Lynda! I definitely enjoy your blog immensely as well – Taste Food is an amazing site! Love that we share the travel bug! Katherine – Congratulations on your award – well deserved. I always love coming to your blog reading about your adventures. And i am honored to have it passed to me. Thank you! Oh Delishhh thank you thank you thank you! Passing it onto you was an easy choice! Thank you Patty! I only recently discovered your blog and am totally hooked! If you do ever make it to Israel let me know! Honestly Israel was one of the few places not on the top of my list to travel, I just hadn’t thought about it. But now that I live here I just love it and am so happy to be here. I know! I get stressed out knowing how much travel there is to do in such a short time! This week I’m doing pretty good: down south to the beach at Eilat, then to Tel Aviv, then camping up north! Have to get to Thailand and Morocco! And of course, Nami, you so deserve it! Katherine, thanks for thinking of me! I will have to take you to my olive guy. Even if you don’t like his olives, you’ll like him …. Liz, you’re my go-to source for Israeli food everything! And yes, you must take me to your olive guy. I’m learning, slowly.